So when I googled Tumblr to find the Tumblr page on Wikipedia, the page ended up being “semi-protected.” I had no idea that some of the pages on Wikipedia could be semi-protected and I had to click on the little lock icon in the corner to read more about it. Apparently, some pages on Wikipedia are protected so that in order to edit something on the page, you need to sign in and sumbit an edit request… because I was not really willing to do this, I decided to look up the more general, Microblogging wikipedia page to see if this was protected. Luckily, this page was not, and I could make edits by simply following the instructions listed on the practicum page of our class site. 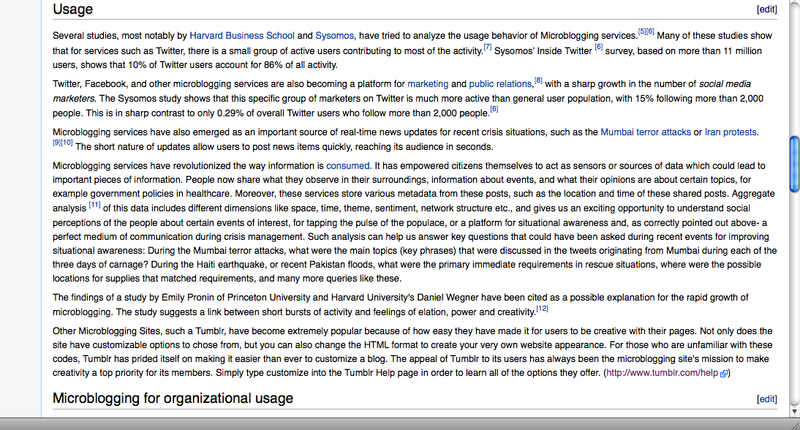 I decided to contribute to the “usage” portion of the Wikipedia page, and since Twitter took up a lot of the microblogging description, I wanted to add a sentence or two on Tumblr in this section. What sparked me to want to add to this part of the page was the line about a study trying to understand why microblogging has become so popular as it reads, “The study suggests a link between short bursts of activity and feelings of elation, power and creativity.”I wanted to add a line or two about how Tumblr has changed the microblogging world because it makes it so easy to customize and be creative with your blog page. I also wanted to contribute to this section because I knew that the creative part of tumblr was something I had experimented a lot with over the course of my fieldwork activity, and there are lots of credible citation sites that can backup my description of Tumblr in this way. Besides the electronics I used every day such as my cell phone and computer, I was surprised to find that I don’t really use many computerized things other than my laptop. However, my laptop is almost never closed! I use it in class, outside of class, at the library, in my room, and because I’m using so often, the only times I’ve ever needed to close the screen is when I am transporting it in my bag to another place. I don’t have an ipad or kindle/nook, just a computer and cell phone. And while that seems fairly technologically simple these days, I find that I am on my computer for almost everything. Because I have a blackberry instead of an iphone, I don’t use it for anything other than contacting my friends through text/BBM… if I had the iphone I’m sure I would use it as often as my computer depending on where I was. My computer was used for Facebook/all school related things/skype/music/and online shopping. I’ve found that I’m an online, surfing shopaholic. I spend a lot of my free time when just talking to friends on different sites just looking but never buying. Even when I’m using other electronics such as my TV, I’m on my computer simultaneously online shopping or facebooking when I’m not doing my homework. If you were to ask me to live an evening without my laptop, it would be extremely difficult. While most people say their cell phones are glued to their hands, I think I would rather spend that evening without my blackberry rather than my computer. This got me thinking about how important the internet is in my life, and even though my smart phone is internet accessible, there is nothing like having a 13 inch screen. I believe now that it is not the device itself that is so important in our lives but rather the internet. Maybe for those people with iphone who are addicted to their games, their devices hold a larger place in their lives, but for me it is access to the internet that makes my computerized lifestyle so valuable to me. I think buying an iphone or computerized tablet such as the Nook/ipad would add extra chaos to my life where I would be using multiple devices to contribute to my computerized lifestyle fueling my internet addiction rather than the one laptop computer I’m currently attached to now. Just when I was positive I had conquered everything Tumblr related and there was nothing left to write about, I was surprised again by some really cool features that I had not yet discovered. 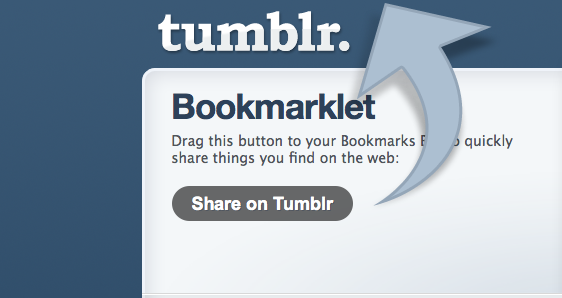 Because there is a large list of websites I visit everyday already occupying my Firefox’s bookmark-toolbar, I was excited to learn that Tumblr has a “Bookmarklet” feature. This allows me to drag the “bookmarklet” button to my bookmarks bar so that I can easily click the button to post material to my tumblelog from whatever site I may be visiting at the time. This feature is common among collage websites such as Polyvore that I have used for my tumblr, Beauty and the Badger, to create virtual collages however I had no idea Tumblr had an option similar to this one for itself. Once I dragged the “Share on tumblr” bookmark to my toolbar, I could browse the web and easily click the button to upload the link to my tumblelog without having to even open a separate tab or window for tumblr itself. A little box appears asking me if I would like to post the link with a description and once I click okay it’s uploaded! Another cool feature very relevant to our recent discussions about copyright laws and the internet is the Feeds feature. 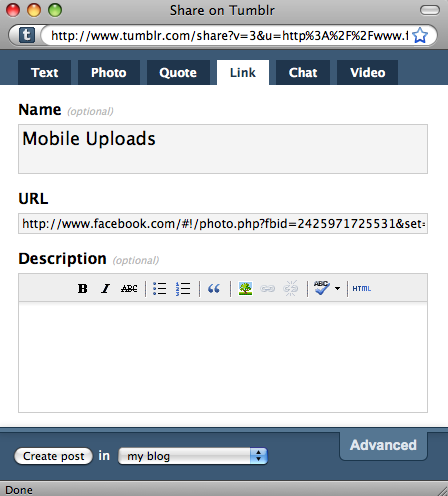 Feeds allow you to import posts from as many as 5 sites you may use other than Tumblr but the material imported must be your own. Tumblr is extremely strict on this rule when it comes to Feeds, and an importation of content that is not your own will lead to an immediate suspension of your tumblr account. While this obviously limits the feed feature, it is Tumblr policy to protect the copyrights of others. Tumblr takes pride in the fact that they have made posting to your tumblelog as easy as possible. While the Bookmarklet seems to be an incredibly fast way to post, Tumblr has not stopped there. For people who still use AIM (AOL instant messenger), TumblrBot can be added to a buddylist to ensure content can be posted through a simple IM and for those who have a MAC laptop, there is Tumblet Widget option. This allows you to download an easy access Tumbler Widget to your Mac’s dashboard for posts coming directly from your desktop. From iPhone, to Blackberry and even the Android, applications and computer features are always accessible for download to making posting content faster, easier and therefore more effective!! Since Hulu specializes in TV shows, movies, and trailers, I thought the best video to observe on YouTube was a TV show similar to the ones you would typically find on Hulu. I decided to watch an episode of America’s Next Top Model that had been streamed to YouTube by an average user and an episode of the same show uploaded on Hulu. Because YouTube is known as the “broadcast yourself” website, the videos uploaded on the site are most often not professionally done whereas the same video on Hulu is of crystal clear quality. A perk of having watched the show on YouTube is that there are no advertisements to watch in between 15 minute segments. A nice feature about using Hulu however was that all of the episodes were lined up in a row chronologically so when I finish one episode, the next automatically pops up on the bottom whereas YouTube would make you search for the next episode, assuming the next one was somewhere on the site. While most episodes were viewable for free through the site, there were a few popular ones that were only watchable by Hulu Plus, a feature of the site accessible via a subscription and monthly charge. This allows you to view the most popular episodes– free of commercials. Although I prefer Hulu to YouTube when it comes to watching my favorite TV shows, with Comcast digital cable and all of the OnDemand features today, there is no need for the online world of television unless I am away from my home TV. YouTube also has almost everything I could ever be looking for, whether it be funny videos uploaded by normal people, to official TV shows illegally streamed online whereas Hulu feels very official. Hulu seems to be more of an online version of my television rather than a video based site for everyone to contribute to. While YouTube is almost always commercial free, Hulu has high quality, full length episodes of every show whereas YouTube is more user based and collaborative, where small clips from each episode can more easily be found than full length episodes. Truthfully, I don’t think many people, myself included, really follow online copyright rules and regulations. When I am looking for a picture to add to a presentation or paper, I don’t worry about giving credit to the picture poster when I take one from Google Images. Similarly, I have no problems with illegally taking music and movies off of the internet. When I sat down to write this post and realized I don’t feel any remorse for illegally downloading content off the internet, I also recognized how hypocritical it all was. It’s funny to me that I would never, and have never, shoplifted from a store before and I would scold somebody for stealing something in person, but I have no issue stealing things I haven’t paid for off the internet. For example, I use a website that takes music directly from YouTube, converts it to be compatible to Itunes so I can listen to any type of music found through that site for free. And because almost every song I might want to download is available in some form via YouTube, I very rarely ever have to pay for a single song. This is no doubt stealing music and yet I have no issue with it and still I would never think about stealing a CD from a Best Buy or any other store. That had me wondering why my values are so righteous in reality but virtually criminal. Why would I ever think it is “okay” or fine to steal something off of the web but not in real life. My theory is that because I am sitting behind a computer where nobody can see me, that I don’t have to be as virtuous behind a computer screen as I am in person. I also think that the reason I am this way is because I have always understood the internet as a somewhat free experience… and therefore anything that is found on the web is free as well. If you put something on the internet, I automatically assume that is is there for me to see or use. I never once feel bad about using Wikipedia without having paid for it or watching a movie on YouTube before it is even out in theaters because somebody else put it there for me to see. Even though they a movie was illegally streamed, I assume that because I was not the one who illegally posted it, I’m not doing anything criminal and so I go ahead and take advantage of it being there. However, I do recognize that this is wrong and it is the reason the music industry has lost so much money over the years from illegal online downloading. To be honest though, I don’t think it will stop me or anybody else from doing it. Did you mean: ariel baron? 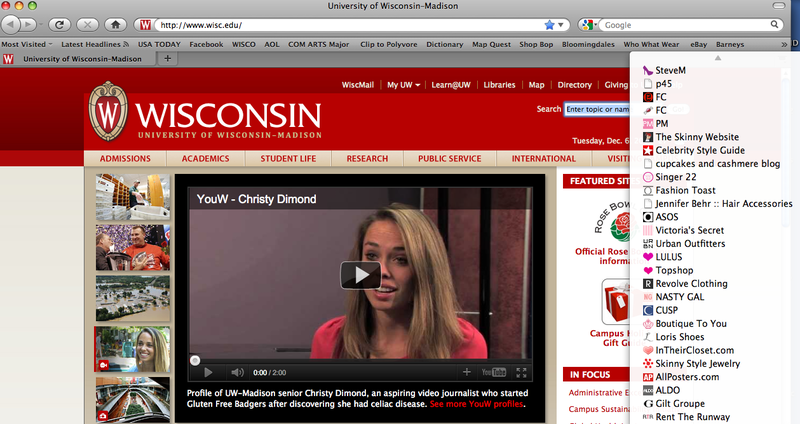 So today I Googled myself. The second I pressed enter after typing in Ariel Barron, Google asked me if I meant Ariel Baron instead of Barron. Apparently Ariel Baron and Ariel Barron-Robbins are more popular google names than my own, as Ariel Baron-Robbins is a freelance artist with artwork all over the web. The first few site results consisted of my own social media/ microblogging site links: Ariel Barron | Facebook, Ariel Barron | LinkedIn, Ariel Barron (@ArielJordyn) on Twitter. I was not surprised to find that the only websites google had on me and my actual real name are the sites that I most typically use. I was surprised however that there are not more Ariel Barron links to facebook, twitter, and linkedin besides my own! I would think there are more popular people out there with my name who use those forms of social media. I also found myself on a classmates.com link to my middle school, BZAEDS, even though I’ve never created an account for that site before. Similarly Amazon.com had some link to my account with them that was not accessible without password thankfully. After moving to the second page, my name became more further and further from my own. There were articles on people such as Elissa Barron or Antonio Ariel-Baron and so on. Someone with my same name is even a Track and Field champion in Salem, Oregon in 2009 and those kinds of results went on for pages with the articles on people with my name who are obviously not me. However, the assignment did not specify whether the google search should be limited to the web, so I decided to take the research further and click on the other google options such as images, videos, maps, news… and found nothing on myself. Only links to people with some version of my name that have done much more interesting things than myself. I’m most happy that there is nothing out there on the web that could hurt me if I were to be googled by a future employer. After such a tragic loss and horrific ending to the Michigan State vs. Wisconsin football game on Saturday night, I took to my tumblr page, Beauty and the Badger, to release some of the anger I felt towards the situation. In doing so, I decided it was time to try something I have not yet experimented with on tumblr. In my despair I started searching Wisconsin football in the search section of tumblr and found “tags” and “categories” of people’s tumblr pages on the subject . Whether it was just one post mentioning the amazing badgers or a tumblr page also dedicated to them, a list of people who had just posted about the game popped up instantly. As I scrolled through the good and bad posts, I found the people who praised Wisconsin for their effort, and posted pictures of the game or Russel Wilson captioning them in ways that expressed their love for the team. So excited to have found fellow supporters, I used the “reblog” button to post their post on my tumblr page. I captioned theirs with my own title and all of the comments/likes that people had pressed on the post followed along with it. This was a feature I had not yet used because I had never found a reason to reblog somebody else’s post on my own tumblr page until now. When I realized there were others out there just as upset as me on tumblr, I had a reason to post their thoughts on my own page. Then I realized that this is exactly what a lot of internet activities are about, forming a community of common interests and followers as Watson has mentioned before. 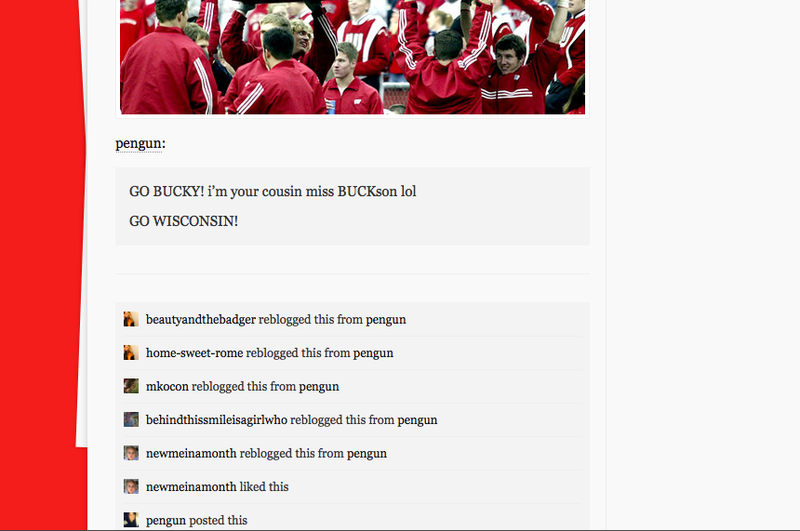 Here is one of the posts I reblogged of a girl who took to her own tumblr page to express her love for the almighty badgers! It was great I could show her that I agree, support her post, and appreciate her love for the badgers by reblogging her post on my own!